The above quote reflects the discomfort that the US military had (and continues to have) in coming to terms with an aspect of warfare that was becoming increasingly apparent in the wake of its struggles in Iraq and Afghanistan. While many were concerned that the military was gearing up to take on political objectives and employ political methods, there was a growing understanding that the “traditional” way of doing business was not working as well as might be hoped, and a growing number of voices arguing that these problems were not going to go away any time soon. So the Pentagon set out to try to come to grips with the problem, formulating a new doctrine of irregular warfare to encompass the many interrelated issues that it was confronting. 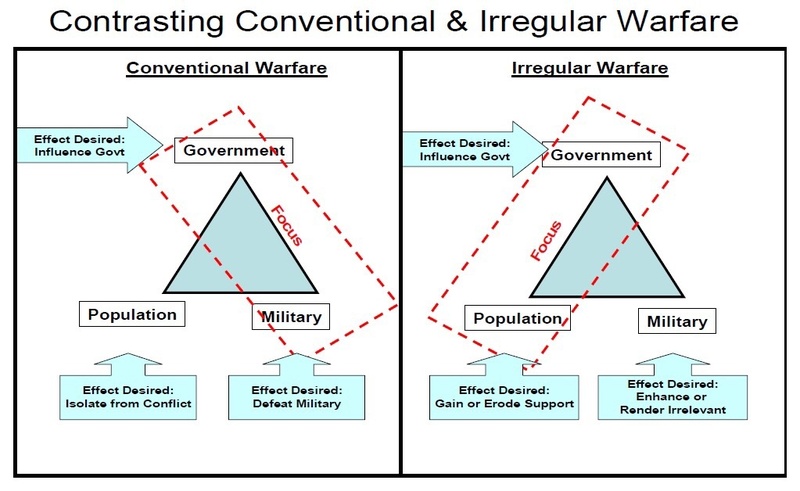 Irregular Warfare is defined in US joint doctrine as “A violent struggle among state and non-state actors for legitimacy and influence over the relevant populations.” As such, it encompasses much of what has until recently been considered to be traditional warfare, since militaries have long understood that they must take public perception into account in their planning. However, it also includes areas of military operations that are not as well-known, and in fact seek to maintain that low profile. Such “special” operations are understood to be politically sensitive and thus often function best when their existence goes undetected. Complicating things further, according to this definition, irregular warfare also includes activities that are usually not considered to be the purview of the military, such as strategic communications, diplomatic activities, and other forms of political or cultural engagement. As opposite sides of the same coin, while each may be independently useful in a given situation, they are usually best used in some blended form based upon the scenario at hand. For example, irregular warfare tends to be of most use in dealing with non-state actors, when deniability is required, or when the instability to be addressed has its roots in popular unrest. Because of this, current US military doctrine describes the five core activities of irregular warfare as counterterrorism, counterinsurgency, foreign internal defense, stability operations and unconventional warfare. These activities are highlighted not to limit the scope of irregular warfare, but because each necessarily involves the attempt to either bolster or undermine the legitimacy of a foreign government in the eyes of its own population, or some portion thereof. In fact, this could be considered a second definition of irregular warfare, albeit a more circumscribed one. In future posts, we will return to these considerations again and again as we explore the many facets of irregular warfare.